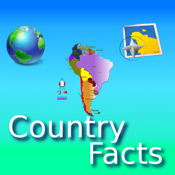 Country facts is based on the concept of learning by playing. The app has 2 modes, Learn mode and Game mode.In Learn mode, kids can explore each place on the map to know the countries, capitals,national animal, national flag and the rivers. In Game Mode, kids locates the capitals and score the points.